This is a photo many might have seen before. The first time I saw this photo was more than 20 years ago, probably in the early 1990s, can’t recall where, but it was at a photo exhibit where I remember I stood riveted there at the viewing. The first atomic bomb was dropped on Hiroshima on the 6th of August, 1945 and a few days later on the 9th, the second atomic bomb was dropped on Nagasaki, after which this photo was taken. 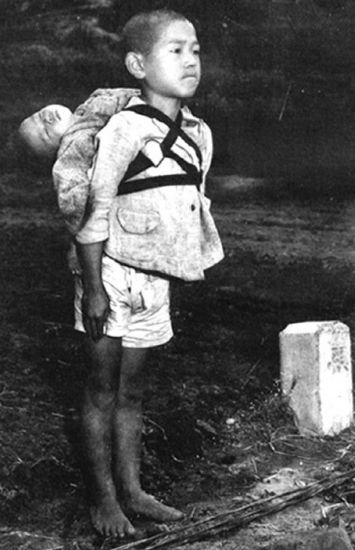 This young boy, with his dead brother strapped on his back, standing erectly, feet placed together, with a grim, determined expression, was waiting in line at an open cremation pit. In viewing this photo, which absorbed me, my eyes soon welled up with tears. It brought back many memories of the past. I managed to ignore the Americans who were looking at me. However, I was touched by the explanation of Marine Sgt. Joe O’Donnell, who was assigned to photograph the aftermath of the bombing of Hiroshima and Nagasaki with instructions not to photograph the people. Knowing the instructions, he photographed this boy with his private camera. O’Donnell was a 23-year-old young man. He felt like hugging the boy but held back his feelings for fear that he would destroy the boy’s determined intentions and was unable to do it. The horror of nuclear weapons is captured in this photo by Marine Sgt. Joe O’Donnell of a young boy standing in line at a cremation pit. Later, his hope to meet him again never happened but he continued to wonder if the boy survived or passed away. He returned home with the photos, which remained sealed in his attic. Making up his mind, however, to deal with latent, bitter memories, he made public the photograph, and 45 years later began a one-man anti-nuclear war protest. In America one can bask in criticism, but it was a lonely, isolated and unsupported task that he was able to overcome. His son rose to the occasion in support. In 2007 — ironically, on Aug. 9, the date of the dropping of the atomic bomb on Nagasaki — he passed away to the other world. During his able years, he and his son made repeated visits to Japan. This photograph is presently on display at the Nagasaki Atomic Bomb Museum. Last year, I visited Nagasaki to relive my deep memories of the past and spent an inordinate amount of time with the photograph at the museum. As I approached the exit of the exhibit, it was difficult to make my final departure. “From Sasebo I entered Nagasaki, found myself on a small hill overlooking the city. Men with white masks came into view. They were working nearby a dug out pit about 60 cm deep (appx. 20”). The men were placing in the coal burning pit the dead bodies taken from the pile on the hand-drawn wagon. “I noticed a young boy, about 10 years old, falling into the line which was being formed. He had what looked like a baby strapped to his back. This was a common Japanese scenario of the pre-war years when young children often carried baby brothers and sisters while they engaged in play in the open fields. But the mood and appearance of this boy was quite different. One sensed in his determined demeanor that he was at the fire pit for an important purpose. Moreover he was barefooted. “As the young boy moved closer to the edge of the burning pit, his eyes focused in concentrated expression. He stood this way by utilizing all of his remaining energy. Was the little boy strapped to his back sleeping? His head remained permanently in a lean-back position. “He stood at the edge of the burning pit for 5 to 10 minutes. The masked men slowly approached him, carefully began to remove the fabric strap. At this moment, I realized for the first time that the young baby on his back was actually dead. The men took the hand and the feet of the baby and gently placed it across the burning coals in the pit. “First of all, a melting sound ‘ju-u-u’ was heard when the young body was placed in the fire. Then a blinding flame immediately whirled up. A flame like a brilliant sunset red was cast on the cheeks of an innocent young boy standing erect at attention. It was at this moment that I mistakenly thought that his lips, which appeared to reflect the redness of the flame, were actually bleeding. However, due to the young boy’s gritting of teeth, his lower lip had turn red; there was no bleeding. The ability of one photograph to move emotions is amazing. The message is very clear. There is much I would want to say about the indiscriminate dropping of an atomic bomb, without concern of the young and old, men and women, townspeople who basically would have been anti-war, which resulted in a massive human slaughter. However, as one human being, I should like to share my personal thoughts. Man’s continual conduct of wars produces only countless forms of tragedy, brutality and madness; there is a great need for peace education for mankind. Wars sacrifice the lives of the innocent populace; atomic bombing, carpet bombing, mass slaughtering must be stopped and must not be repeated. Two years ago, I made a contribution to Rafu Shimpo about Hiroshima too. Seventy years ago the atomic bombs were dropped in Japan, and today I want to continue to recall this photograph.